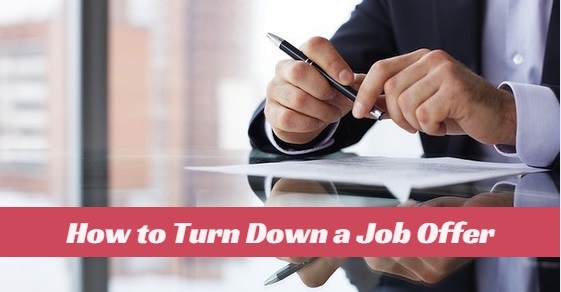 If you want to turn down a job offer remember it might not help your career to stay comfortable, good and on track afterwards especially if you have been looking for sometime. During the interview process a candidate has an opportunity to assess the company, his future colleagues and the work environment of the company. Thus it is not surprising that after the candidate receives the job offer, he might sometimes turn down the job offer. Also in the recent years a new trend has been noticed in the recruitment industry where the market is candidate driven in many instances. The significance of hiring the right candidate for the company plays an important role as companies might lose out on both time and money considerably, if a candidate becomes a misfit. Thus the senior management personnel’s of a company are playing an active role in the hiring process nowadays and job offers are being rolled out quickly. But if you are still unhappy with the job offer, you would need to write a mail to them and state your reasons for turning down the offer. Here it is important that you fully understand regarding why you are turning down the job offer after analyzing the factors in detail. Have you evaluated the job offer? Before you write the email where you turn down the job offer, it is essential that you analyze and evaluate the job offer you have in hand. Here it is essential that you understand the management style of the company and even meet your future boss if necessary. What is the work style of the person? How effective is he as a manager? What is the turnover percentage of his current team and how many teams does he handle? Does the company have training programs for its employees? What is the growth rate of the employees in the company? The answers to the above question is essential as you would need to understand whether accepting the offer would be a good move for your career or it would stagnate the progress that you are making currently. The company from where you received the job offer is good but the designation offered to you is not according to your standards. Thus the level of responsibility and the skills that you wanted to use in your job is not as per your expectation. For example if you are looking for a client serving role in a sales environment and the new job just offers the opportunity to work as a sales personnel only. You can point out to the company that along with sales work, you are looking to work with major clients and this would help you to use for client servicing and negotiating skills. This might work at a latter stage but at present the work you get will not be a good fit for you. Sometimes you might consider a company to be great for your career growth. But once you take the interview, you become more aware of its internal procedures, the people working in the company and their work ethics. When analyzing all the above factors you know that you will not be comfortable to work in such an environment. Thus you turn down the job offer. It is essential that you do not air your comments in front of the company’s personnel, as the world is small and you do not know when your paths would get crossed again. When you receive the job offer the job profile and the company is very attractive, but the compensation package is dismissal. Thus it would be best to do a research on the market and find out what are the averages salaries offered for the job offer you have in hand. Then you can analyze the situation and request to the hiring manager to revise the compensation offered. Here you can highlight the years of work experience you have and how much value you would add to the company. However when salary negotiations fail, you would need to turn down a job offer. During the course of your interview, you can ask candidly regarding what happened to the last employer and what was the duration of his employment tenure with the company. Here you might be informed that the last employer worked in the company for a few months only. Thus you would need to understand that the department has a frequent employment turnover. This could be bad for your career growth and after a detailed investigation; it would be wise to turn down the job offer. Today candidates tend to avoid long commutating hours to and fro from office. If you stay in the city and the office location is a two hour drive from your home then you would be commuting for 4 hours daily. Thus you have to understand whether you would be able to take the daily commuting stress and then in the end might turn down the job offer. During your interview time, you were asked if you could work frequently on weekends. You had answered that if the exigencies demanded you were open to it. But later on you discovered that most managers in the company work or undertake business travel during the weekends. You have a growing family and love to spend quality time with your sons in the weekends. Since good work life balance is not present in the current job opportunity, you turn the job offer down. You have visited a few websites like Glassdoor and tried to understand various feedbacks regarding company from its ex-employees. But to your utter dismay you have found that online reviews regarding the company are very negative. This makes you very uncomfortable and thus you reject the job offer. How to Turn Down a Job Offer? In the last few months you have attended many interviews and thus have multiple job offers in hand. Here you have to understand which job offers best suits your career objective and is beneficial for your career and family. However the realities of life are that you have to get back to other companies and politely decline their offers. You have to understand that the work place is very dynamic in nature and you never know when a potential employer becomes important to you in the near future. Thus you have to be gracious and decline the job offer in such a manner so that the employer respects you. Before you call the hiring manager and communicate that you are declining the job offer, it would be a good idea to write down the main points on a piece of paper. This would help you take control over the conversation, as the person at the other end of the phone would do his best to win you over. While speaking over the phone, you should maintain a professional low tone and maintain your inability to accept the offer and thank him and the company for the job opportunity given to you. In case the hiring manager is not available due to various reasons, drop a voice mail which would state that you have something important to discuss. When you were interviewed for the first time by the company, a process had started which ended with the job offer being sent to you. Since you are not accepting the job offer, you have to end the process from your end. Thus after speaking to the hiring manager, you should write a simple crisp mail which would indicate that you are declining the job offer. This letter should be addressed to the hiring manager. Here you thank the hiring manager and the company for the new opportunity given to you but explain your inability to accept the job offer. The letter should be crisp and business like. It is best to avoid writing long letters. Jodi Glickman in an article in the “Harvard Business Review” explains that it would be advisable if you as a candidate mention to the hiring manager that you would like to be in touch with him and share your social media details with him. This would indicate that you consider the hiring manager to be an important contact and you would want to be in touch with him in the future, in case new opportunities arises, for which you can be considered. As a successful professional you must understand that turning down an offer should never be considered lightly. It should be undertaken with seriousness and the element of graciousness should be present in all instances of communication with the hiring manager and the company. Few years down the line, your path with the hiring manager might cross again and then you might be recruited, as over the years you have kept good relations with him all long. You must spend some time to understand the job offer and analyze thoroughly your reasons for declining it. Here the words of Julia Morgan are very significant when she mentions that never turn down a job offer as you think it is very small for you. Since you never know how this same job could have leaded you to new career paths which you would have never dreamt off. Next articleHow Do I Prepare for an Interview Easily in the Last Minute?